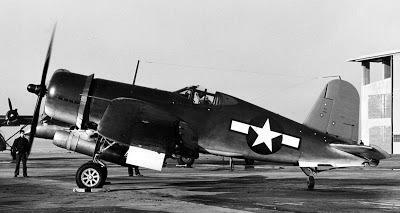 The first flight test WE19B under a Goodyear FG-1 Corsair airplane. The WE19B was a improved version of the first engine, the WE19B (later known as the J30) was flight tested in January of 1944 as a booster unit on a Chance Vought Corsair FG-1 fighter jet. The engine delivered 1365 pounds thrust and weighed 731 pounds. Digital reproduction of original black and white photograph: U.S. Navy Aircraft History. Copyright to this resource is held by Tommy H. Thomason and is provided here by RICHES of Central Florida for educational purposes only. Thomason, Tommy H. "Westinghouse: From Hero to Zero." U.S. NAVY AIRCRAFT HISTORY, March 21, 2011. http://thanlont.blogspot.com/2011/03/from-hero-to-zero.html. 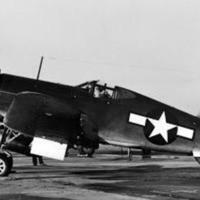 “First Flight Test of the WE19B Engine Under Chance Vought Corsair FG-1.” RICHES of Central Florida accessed April 23, 2019, https://richesmi.cah.ucf.edu/omeka/items/show/7708.